Lexengine: International Crimes Tribunal for Bangladesh. 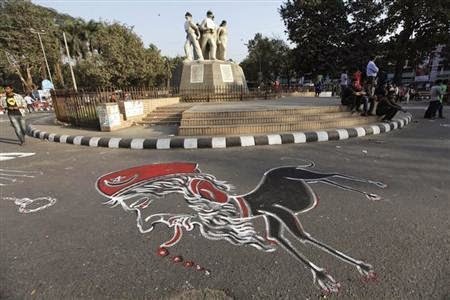 the Pakistan Army and collaborators targeted Hindu communities, intellectuals and members of the political opposition for attacks. Historians estimate that, during the conflict, between two hundred thousand and four hundred thousand women and children were raped leading to an estimated 25,000 war babies being born. Estimates of persons killed during the conflict range from between 269,000 to one to three million. An estimated ten million refugees entered India, a situation which contributed to its government's decision to intervene militarily in the civil war. Thirty million people were displaced. Susan Brownmiller documented that girls from the age of eight to grandmothers of seventy-five suffered rapes during the war. In 2009 Shafique Ahmed, the Minister of Law, Justice and Parliamentary Affairs, announced that the trials would be organized under the International Crimes (Tribunal) Act 1973. This act authorizes prosecution only of persons living within Bangladesh who were members of the armed forces, including paramilitary groups. The act was amended in 2009 to update it, and the International Crimes Tribunal Rules of Procedure and Evidence were put in place by 2010. Some critics maintain that further amendments are needed to bring the act up to the standards of international law. 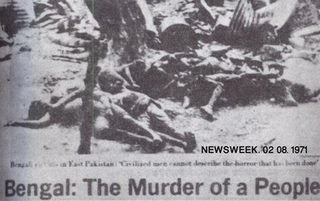 The International Crimes Tribunal (ICT) was established as tribunal in Bangladesh that aims to investigate and administer justice regarding the war crimes, crimes against humanity, genocide and crimes against peace committed by Pakistan army and their local collaborators Razakar, Al-Badr, Al-Shams during the Bangladesh Liberation War of 1971. 2008: In public election, one of the principal electoral manifesto of the Awami League was to initiate the trial process of war criminals. 29 January 2009: As promised, a member of parliament from Awami League submitted the proposal of the trial of war criminals on 29 January 2009 in National Parliament and the proposal was accepted unanimously. 25th March 2009: Finally after 39 years of Liberation of Bangladesh, on the 25th March, the tribunal, attorney panel and investigation organization was formed for the trial of the ones accused of war crimes. 9th July 2009: Considering the recommendations of the Commission of Law, some amendments were done by verbal votes to bring the law up to date and in keeping with international standards for similar trials. July 2010: The tribunal starts its official journey by the first hearing. Justice A T M Fazle Kabir and Justice A K M Zahir Ahmed, led by Justice Md. Nizamul Huq, the Chairman of the tribunal directed the hearing of International Crimes Court in the old high court building at Dhaka.After the hearing, arrest warrants were issued for four leaders of Jamaat-e-Islami — Motiur Rahman Nizami, Ali Ahsan Muhammad Mujahid, Muhammaad Kamaruzzaman andAbdul Quader Mollah for crimes against humanity in 1971. Abul Kalam Azad (Bachchu), an Islamic cleric formerly associated with the party. Two leaders of the opposition Bangladesh National Party were also indicted: former government ministers Salahuddin Quader Chowdhury and Abdul Alim. Human Rights Watch initially supported the establishment of the tribunal and recommended amendments to the 1973 law. The government already had planned to update the law, and proceeded in consultation with experts. When the tribunal was being planned, Stephen Rapp, the United States Ambassador-at-Large for War Crimes Issues, said that the "US government will help Bangladesh hold an open and transparent war crimes trial with the rights of defense for the accused." Kristine A. Huskey, writing for the NGO Crimes of War, said Rapp gave a ten-page letter to the prosecution which included recommendations and various concerns. A Wikileaks leaked cable in November 2010 from the US State Department said, "There is little doubt that hard-line elements within the ruling party [AL] believe that the time is right to crush Jamaat and other Islamic parties." Bangladeshi opposition political parties have demanded the release of those held, claiming the arrests are politically motivated. Shafique Ahmed, the Minister of Law and Justice, disagrees, saying, "No one is being arrested or tried on religious or political grounds." In February, 2013, thousands of protesters took to the streets of Bangladesh to demand the execution of a leader of the country's biggest Islamist party Abdul Quader Mollah after he was sentenced to life in prison for war crimes committed during the 1971 independence conflict. In Dhaka, thousands of protesters had stayed out on the streets since late on Tuesday to vent their anger at the verdict handed to Mollah, 64, who was expected to be given a death sentence. "Our protest will continue until the authorities put him to gallows," said Mohammad Zafar Iqbal, a university professor. The rally was centred on Dhaka's Shahabag Avenue, which protesters dubbed the "Tahrir Square of Bangladesh", recalling the scene of protests in Cairo which led to the overthrow of Egyptian strongman Hosni Mubarak.